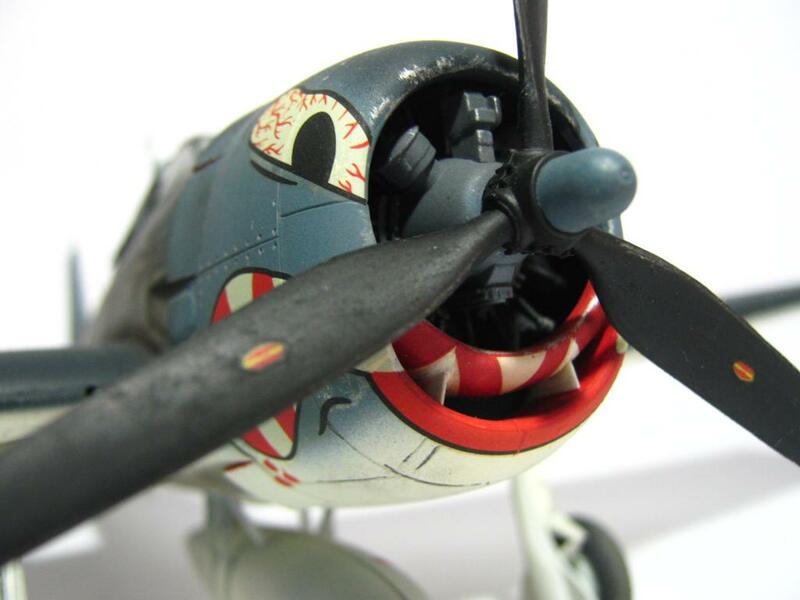 This 1/48 scale Hellcat carries the distinctive markings from VF-27. Definitely the most ferocious looking Hellcat squadron in the US Navy! This Hellcat probably went down with the USS Princeton when she was mortally wounded by a bomb dropped by a Jap ‘Judy’ on 24 October 1944. The kit is from Hasegawa and was built OOB except for the scratcbuilt aerial wires. Modelmaster enamels and Doc O’ Brien’s weathering powders were used to add color to a true American legend of the war in the Pacific! Nice job on the Hellcat, especially the weathering Morne. Thanks Jack. Just have to love Grumman’s ferocious felines! Great finish on this one, Morne. Thanks George! I am a firm supporter of Modelmaster enamels and Doc O’ Brien’s weathering pigments. Tried and trusted for many years! 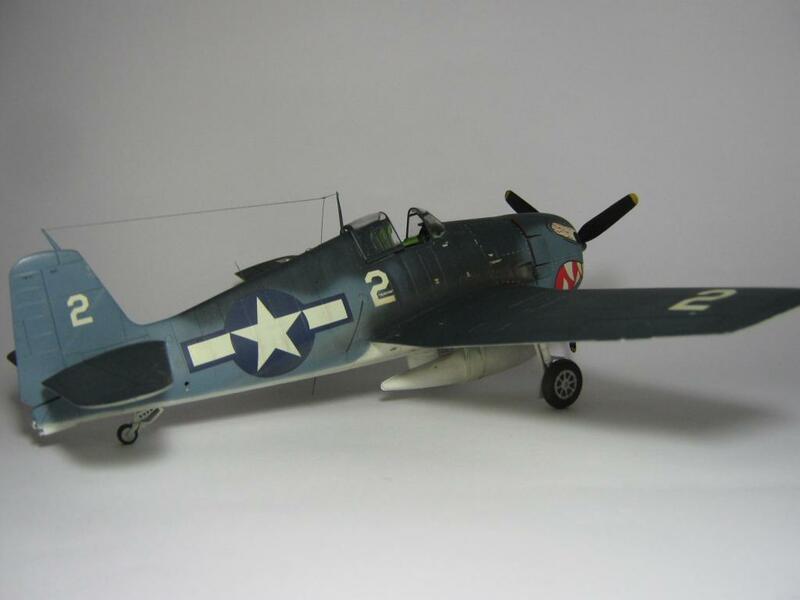 Hello Morne and thanks for sharing your F6F-3 Hellcat build. 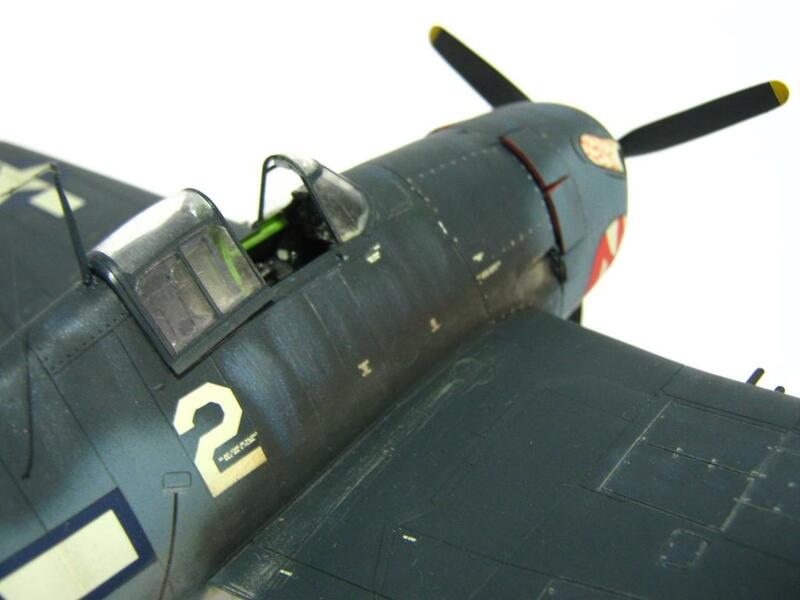 Like the P-47 you recently posted, the weathering on your F6F-3 is quite nicely done. I look forward to seeing more of your builds…perhaps a Corsair? Thanks Jim! I must confess I have a special afinity for Vought’s whispering death. 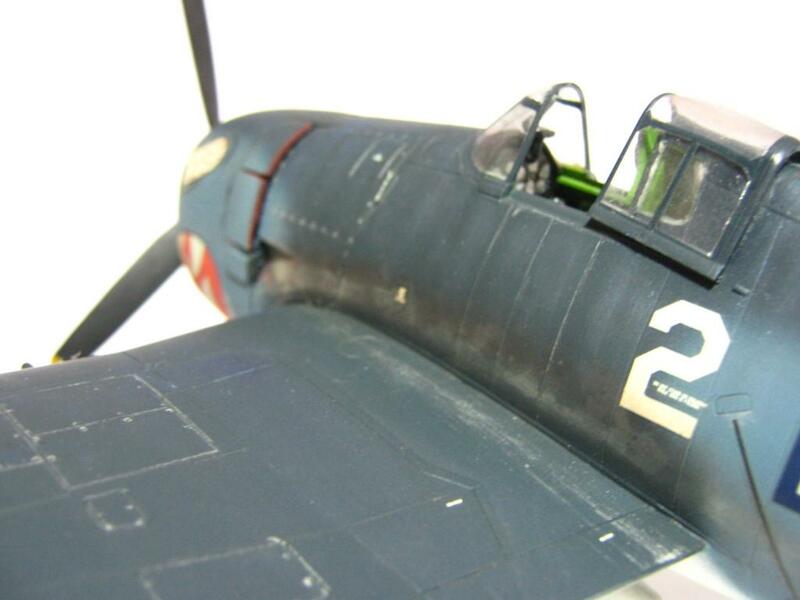 However, I have 8 unbuilt Corsairs in my stash! 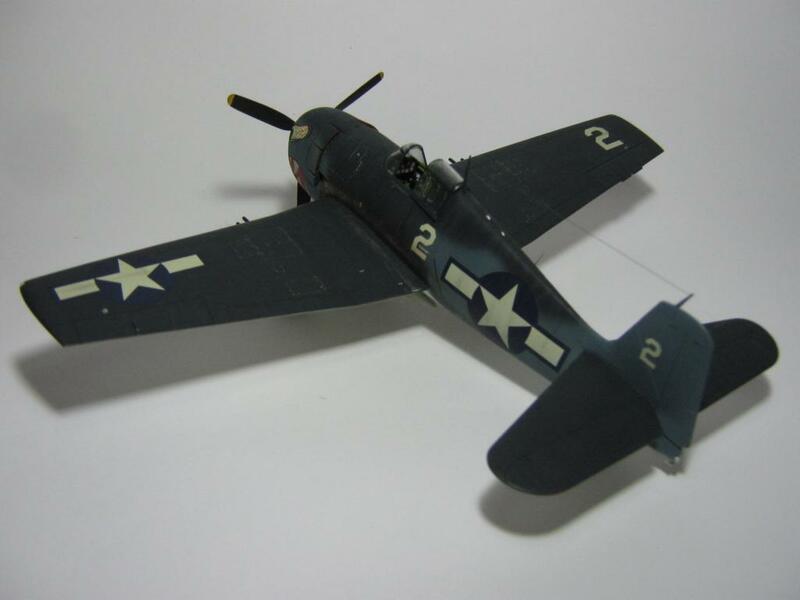 Love the Corsairs from the Korean War. Another realistic looking piece Morne. I like the way you do the erosion & chipping on the panel separations. Thanks Al. I try my best to get it as close to the real thing. You do indeed have a talent for the weathering/detailing aspects on your builds. Another nice job on this one, sir. Thanks for the vote of confidence in my modeling ablities. Love the detailing aspect of model building. Doc O’ Brien’s pigments are truly the best. Mine is 6 years old and I still have enough left for many years to come. You have got the weathering off to a fine tee Morne. It is something I am slowly trying to get to grips with. I use Tamiya weathering powders for now. Hope to see more of your builds. Thanks Simon! Weathering lends character to a model. Practice makes perfect. I use watercolor paint for panel lines. Tamiya’s range of weathering kits are great! Try using pigments like Doc O’ Brien’s as well. 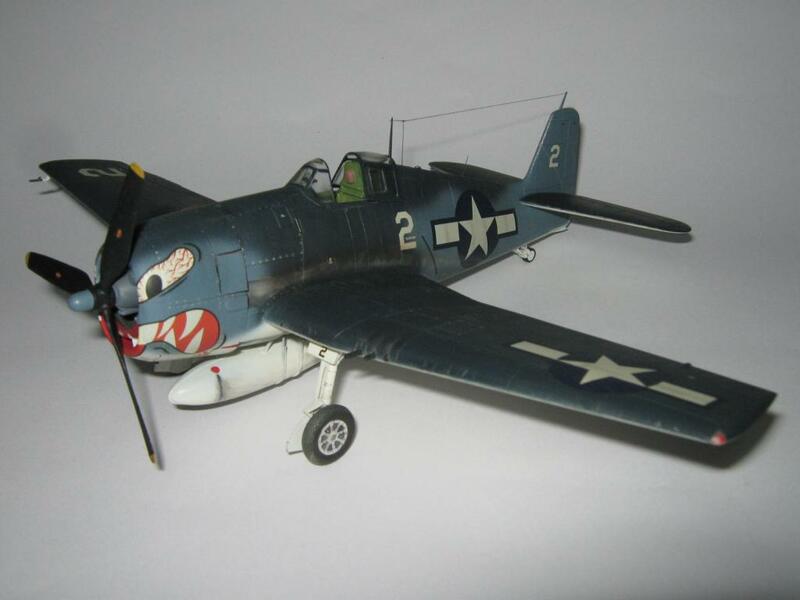 Great looking Hellcat Morne. Another well done finish as well. 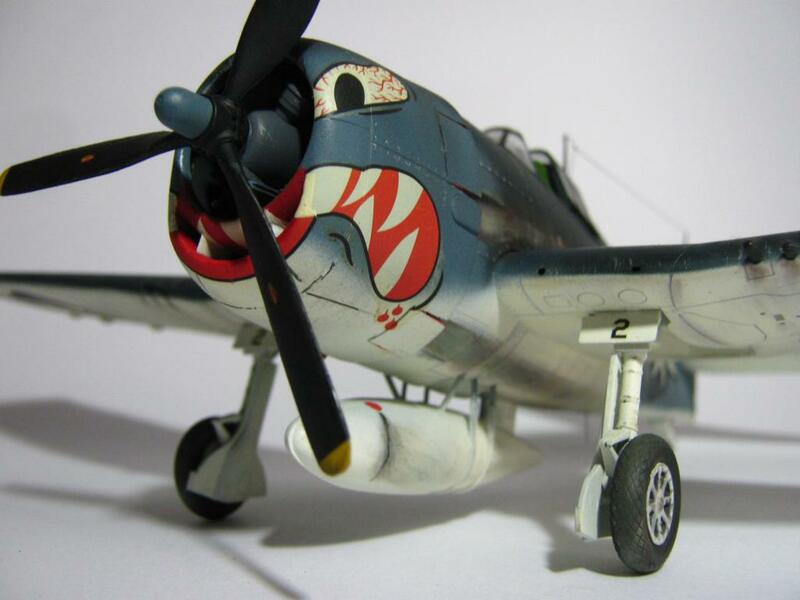 The Hasegawa Hellcat is a sweet building kit too. A very nice kit indeed. 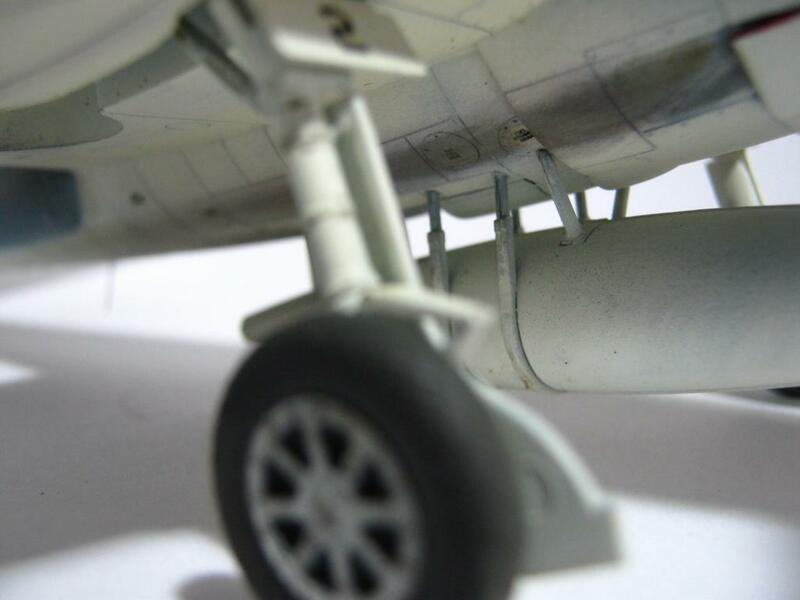 Some Aires aftermarket goodies for the engine and gun bays would make a great kit even better. Thanks! Cool Hellcat. Was the shark mouth common to all the squadron planes or is it an individual marking? I read somewhere that US Navy discouraged “decoration” of their a/c’s perhaphs to distance themselves from the Army air corps? Hi Gregor. Years ago I saw a couple of photos in an Osprey publication showing various Hellcats of VF 27 sporting the sharkmouth markings. really nice weathering – great work! Thanks Ramon. I appreciate the positive feedback on my build! Really nice work Morne. The exposed rivets in places is a nice touch. Hi Mike. Thanks for the thumbs up. I like the weathering aspect of our hobby. Excellent and I agree with everyone else that your weathering is masterful. Thanks Frank. I do try to get it as close to the photos that I have of the airplanes that I build.